THEY LIVE ON A CALM HILL IN SUNNY BRAE, WITH Humboldt Bay barely visible through the veil of trees across the street. 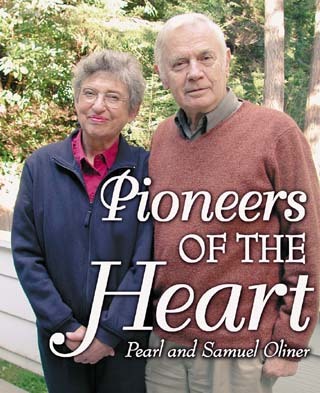 In their early 70s, Pearl and Samuel Oliner are retired from teaching at Humboldt State University (she is a professor of education, he of sociology.) But their apparently quiet life is deceptive. They are pioneers in an ever-expanding field of inquiry that is changing how human nature is perceived, and may yet help to create a more caring, peaceful future. And they're still working at it. The Oliners are among the remarkable number of local residents who play an important role in the world beyond Humboldt County. In their case, they helped start something like a continuing international revolution in academic thought, with implications for how we all see ourselves. They began it with a question. Why did they do it? That was the question. Why did they risk everything -- their safety, their lives, even their families -- for strangers? But some did: they harbored those they were forbidden to help, by aiding Jews escaping from the Nazis in World War II. At other times and places, they leapt into rivers to pull drowning strangers from cars being sucked to the bottom. They ran into the devastated Twin Towers to lead others to safety on Sept. 11. But why? Why did they do it? For a long time the question wasn't even asked. Some individuals were honored as heroes and saints, but that was all, as if what they did wasn't really human. They embarrassed the experts, because what they did ran counter to every prevailing explanation for human behavior, from philosophy and theology to biology, psychology, economics and the social sciences. Self-interest, rational choice, the struggle for survival, original sin, the dark unconscious -- there was no room anywhere for altruism. Auguste Comte, the father of sociology, coined the term in the mid-19th century, but altruism -- unselfish behavior on behalf of another -- soon sunk out of sight. Today it's an academic growth industry. Scholars from all the above-mentioned fields are struggling to answer that question, why did they do it? Because once it was seriously asked, and addressed in a systematic way, it became the elephant in the halls of ivy: It couldn't be ignored. Altruistic behavior calls all those explanations into question, and it begins to suggest new ways of examining what being human is all about. Now those answering that question are part of a movement to find out what's right with human nature as well as what's wrong, to discover why and how we can cooperate as well as compete, be compassionate as well as egotistical, and devise, learn and use the skills of peace as well as the skills of war. And in an irony that is inescapably part of the inquiry, this contemporary search for the sources of good began in response to an historic eruption of evil: the Holocaust. He has told the story many times: a third-person account in his first book with Pearl, The Altruistic Personality, a first-person narrative in his new book, Do Unto Others: Extraordinary Acts of Ordinary People, and at length in his memoir, Restless Memories. It is always powerful and always vivid. Samuel Oliner was 12 when the Nazis raided the ghetto in southern Poland where he and his extended family had been forced to live. His stepmother told him to run and hide. By the end of the day, everyone in the ghetto was gone. Only Samuel, hiding on the roof, remained. In these accounts he remembers with seemingly uncanny precision every moment, every emotion, every sight and smell of that day. Neuroscientists are familiar with this phenomenon: It is common when someone experiences intense fear. Every perception is heightened, every moment lengthens. The memory of it all remains inescapably clear for a very long time. Already resourceful, he made his way out of the ghetto and into the countryside. He took a chance and asked a farmer for bread. As they walked from the field to the house, the farmer chatted about the Nazi raid. They took all the Jews into the woods and shot them, he said. Samuel could not reveal the intensity of his emotions, only a boy's curiosity about the mechanics of death. He asked how they could kill so many. With machine guns, the farmer told him. It took them all day. He wandered the countryside for days, until hunger and the risk of being in the open forced him to seek out someone in a nearby village who had known his family. When he knocked on their door, he faced the possibility of being turned over to the Germans. Instead the woman who opened it hugged him, and gave him a home. He learned to pass as a non-Jew, and survived the next three years until the war ended. Then, with some Jewish survivors, he sneaked into Czechoslovakia. On his way to West Germany, he met his first black man -- an American GI who saw him hitchhiking and gave him a ride. A postwar program relocating war orphans got him to England, and a Jewish network for finding relatives willing to sponsor immigrants got him to an Oliner in New Jersey. He was there less than a year when in 1951 he was drafted into the U.S. Army, as part of a Korean War program that would grant him citizenship in exchange for his two-year hitch. Oliner went to the extent of learning German to get posted to Europe but still he was sent to Korea, where he guarded prisoners of war. His most dangerous moment, he recalls, was the flight east from Seattle upon his return, which ended in a belly flop landing in Montana. But he eventually got to New York, the GI Bill got him started in college, and the wife of a married army buddy set him up with her friend on a blind date. Not much more than a year later, he and Pearl were married. New York was exciting but a struggle, and then Sam told Pearl about the sunny expanses of California. He'd seen it on his way to Seattle to ship out to Korea, and she'd never been there at all. But the friends who had introduced them were there, and so they arranged to go: Pearl became the principal of a school in Oakland, and Sam would get his master's at San Francisco State University. Some years and three sons later (as well as several academic degrees each), Sam got a one-year appointment at Humboldt State. They arrived in the rain. But they stayed anyway. The past seemed safely tucked away, but by the early 1970s Sam Oliner was alarmed by a wave of Holocaust denying: The systematic murder of European Jews had never happened, some people were claiming, and that horrific footage shot by Americans liberating concentration camps was all faked. Not many were saying this, but it was easy enough to see that this is how it could all get started again. Outright lies about the Jews in World War I became the seedbed of fascism in Germany in the 1920s and `30s. So Oliner and colleagues at HSU began teaching one of the first college courses in America on the Holocaust. In a century of unparalleled destructiveness, the horrors of the Nazi concentration camps suggested a human capacity for evil beyond ordinary expectations. The experience of American writer Susan Sontag, recalled just a few weeks ago in an interview with Bill Moyers, was widely shared: She was 12 when she first saw pictures of Dachau and Bergen Belsen as they were liberated in 1945. "I suddenly thought, `Oh my God. This is what human beings can do to other human beings.' I could say that my whole life is divided into before I saw those pictures and after." Sam Oliner taught the evils of the Nazis and of anti-Semitism. He studied and taught the evils of racism, homophobia and other oppressions. Later he would begin one of the first courses in the nation on genocide, with Native American Studies professor Jack Norton, who applied the concept to the attempted eradication of native peoples in Northern California. But in the early 1980s, something happened while Oliner was teaching the Holocaust course. After one of the first sessions of the term, a young woman came to him in tears. She was German, married to an American student. She had to drop the course, she told him, because it was too painful to hear "what my people did to your people." "I was moved by this," Oliner recalled. "First of all, she had nothing to do with it, she was innocent. But her pain got me thinking. What else can we teach besides horrors and murder and torture? What else can we learn?" He remembered the family that had helped him evade the Nazis and survive the war, at great risk to themselves. He began thinking about them in a new way. The Israeli government had begun to officially honor rescuers, and some stories of rescue turned up in memoirs. But there was very little scholarship, and almost nobody was going deep enough to begin asking that essential question, the one that might lead to deriving some greater meaning, perhaps even a way to encourage such altruistic behavior in the future: Why did they do it? It was the question nobody knew how to answer, especially when applied to Holocaust rescuers. It was about this time that an award-winning screenwriter got in touch with Annette Insdorf, author of Indelible Shadows: Film and the Holocaust, the best known and most complete book on the subject (she tells this story in the revised 2003 edition). The screenwriter wanted to write a movie about Oskar Schindler and his rescue of more than a thousand Jews, but he couldn't figure out how to handle the question of Schindler's motivation. Why had he done it? "Neither of us could find a sufficiently satisfying answer," Insdorf writes. Both her parents were Holocaust survivors. A few years later, Steven Speilberg solved the problem of "why" by more or less ignoring it. In Schindler's List, Schindler's motives remain mysterious. Even in this year's hit film about the Holocaust, The Pianist, the rescuers' reasons are mostly implied or obscure. Why this question should be so puzzling is easy to explain, though it may be hard to face. Evil might be shocking, and the motives of informers and bystanders might be shameful, but just about every discipline can supply a reason for such behavior. Beginning with Plato, the mainstream of western philosophy maintains that people naturally act in their own interest, an approach refined and applied to economics and political science. The dominant interpreters of Darwin approve: Even our genes are selfish. "Look out for No. 1" is a law of nature as well as an axiom of common sense, explaining if not always fully justifying every conceivable evil and indifference, from the white lie to the black market, from not getting involved to genocide. Add the explanations for malevolence by the unlikely tandem of Freud and the Bible (Freud suggested dark drives in the unconscious that seemed to express the sinful state of humanity ejected from Eden) and it all seemed awful, but also the way we are. But the family that saved Sam Oliner seemed human, too, even though they were acting against their own interests. Maybe it was time to look at good as well as evil in human beings, and perhaps the place to start was with the people who risked everything for others, at a time when everything was being taken away from those others. It would be a huge task. Oliner began looking around for help. He didn't have to look far. Pearl Merkur grew up in the tenements of Brooklyn, where the Jewish neighborhood was next to the black neighborhood, and they were all poor. She was an excellent student who earned degrees from Brooklyn College and the Jewish Theological Seminary at the same time. She loved the intellectual atmosphere at her college and in the cafes of Greenwich Village, and she got involved in social causes, particularly the early `50s issues that would soon become the Civil Rights movement. Pearl knew about the Holocaust, but it seemed a part of the past compared to the searing issues of the day. Besides, she didn't want to be buried in sorrow, under the heaviness of Jewish history. There should be joy in life, too. As she began her professional career, Pearl Oliner had similar reactions to the one-sidedness of education theory and the teaching of social sciences, her principal area of interest. The prevailing wisdom was that education should develop rationality, with little regard for feelings. She was also told that if research into social subjects was going to be real science, it would have to be as rigid and quantitative as physics. Pearl Oliner believed in scientific analysis, but was still wary of what social science was leaving out. People had feelings, and they were important. So she began tentatively adding elements of emotion and of qualitative research -- that is, stories -- to her work. The title of her first book reflected this duality: "Teaching Elementary Social Studies: a Rational and Humanistic Approach." By the time she had secured a full-time position at Humboldt State, her views on the Holocaust had matured, thanks in part, of course, to her husband. But when child development expert Paul Henry Mussen spoke at HSU, he used an expression she'd never heard before: "pro-social behavior." It turned out nobody had heard it before; one of Mussen's graduate students had invented it, as the opposite of "anti-social behavior." It was behavior that made things better, that contributed to the common good. It said what Pearl Oliner had been searching for without necessarily knowing it. She could combine the rational with something hopeful, something to do with the heart. She had written articles on pro-social behavior when Sam suggested that they work together on a research project, investigating altruism among rescuers. They would be looking at compassion in an extreme form, when its cost could be fatal. It was a major commitment, professionally and personally. But despite the dangers inherent in a couple combining work with marriage, there was a certain logic to it. It seemed that their separate journeys had come to the same point. Besides, it would only take 10 years. In some ways, what they wanted to do seemed crazy. How do you study compassion, or quantify goodness? But they believed that the tools of social science would help illuminate that basic question: Why did they do it? So with the support of grants and the participation of graduate students and colleagues at HSU and elsewhere, the Oliners designed detailed questionnaires for rescuers of Jews in World War II and a control group of bystanders, and interviewed some 800 people in seven countries. They correlated variables, they ranked responses and they listened to the voices telling stories. Their findings were complex and detailed, but a few impressions jumped out. Few rescuers sought fame or reward, but none regretted what they did. Some had forged papers and smuggled Jews to safety. They lied to Nazi officials and their neighbors, and a few committed acts of violence. For some, these activities went on for years. But almost all of them professed something close to astonishment that anyone had to ask why they did it. They said that of course they didn't have to do it, but at the same time, they had no choice. Some said it was what their parents taught them, or what their faith or ethical code dictated. Some said it was just the natural thing to do. Why did they do it? Because strangers in trouble were still people in trouble who needed their help. Because their hearts and sometimes even their heads told them it was the right thing for them to do, that if they didn't, they would damage or even lose the essence of themselves. There could hardly be a more shocking conclusion, at least to the many scholars and scientists who still can't figure it out or even accept it. But for others this study opened a door, and on the other side of it is the possibility of a new way to think about humanity and perhaps even the universe. It isn't the only such door, but it is one that is now wide open, and other explorers are eagerly stepping through it. "The Oliners' work was so careful and so broadly based that it opened the field," says Kristen Renwick Monroe, professor of politics at the University of California, Irvine, and author of The Heart of Altruism. "It gave us a much more sophisticated understanding of the altruistic personality, and made our knowledge much deeper, closer to the root of it. People like me are very deeply indebted to them." By the time the Oliners were finishing their research, editors at the Free Press had heard about it and asked them to write a book. The Altruistic Personality was published in 1988. It led to dozens of speaking invitations -- "People need hope," as Pearl Oliner said -- then to an international conference on altruism in Poland. That led to a collection of studies presented there, which the Oliners edited along with four other scholars, published as Embracing the Other. Their work continues. They established the Institute for the Study of Altruism and Pro-Social Behavior at HSU. Sam Oliner's new book, Do Unto Others, published last month by Westview Press, expands beyond the rescuers and health workers in previous studies to examine ordinary people who performed heroic acts for others, including heroes of Sept. 11, soldiers, and people who risked their lives at accident scenes or during a race riot. Next year, Yale University Press will publish Pearl Oliner's new book, tentatively titled Outsider as Insider: Religious Culture and the Rescue of Jews in Nazi Europe. They continue to share their work with HSU and the community. Sam Oliner recently spoke at the annual Diversity Workshop and the North Coast Education Summit on campus, and Pearl set the framework for discussion at the "Building Communities That Care" workshop, co-sponsored by the Growing Caring Communities Alliance and the HSU sociology department. Meanwhile, the field is expanding all around them. Many social and political theorists are appraising the evidence of altruism. 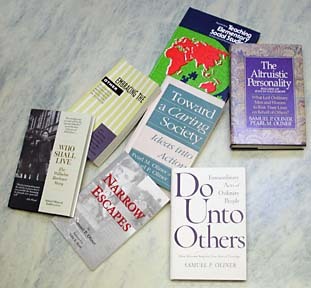 While the anthology the Oliners edited a decade ago contained contributions in seven or so disciplines, mostly within social studies, a similar anthology published in 2002 (Altruism and Altruistic Love) contains essays by scholars in at least 16 different disciplines, including evolutionary biology, neuroscience and biomedical ethics. Now biologists can look at animal cooperation and the fundamental role of symbiosis from a different perspective. A prominent neuroscientist believes that human reason requires feeling, and ethics regulated by emotions are necessary to evolutionary success. A theoretical physicist wonders if there might be something he calls "quantum empathy." Even psychology no longer dwells exclusively on individual illness and bad behavior. There's a new Center for the Development of Peace and Well-Being at the University of California, Berkeley, that sponsors research focusing "on what contributes to the greater good," according to its director, Dacher Keltner. There's a broad new movement called positive psychology, and another called peace psychology. Teaching compassion has become part of the curriculum in many schools at all levels. The Oliners were part of starting all this. Despite the skeptics, "altruism exists," Sam Oliner maintains. "It can be taught, it can be cultivated. If the Holocaust is western civilization's nightmare, then helping, caring and compassion are our hope." William Severini Kowinski is a freelance writer based in Arcata. He is the author of The Malling of America. 1. BONDING: Forming positive connections to places and people. Bonding environments often meet basic needs (e.g., the kitchen) and include formal or informal rituals. DO: Create or take advantage of opportunities to share with others, even if it's as simple as a meal. Understand that forming bonds takes time, attention and commitment. DON'T: Smother individuality, or set insiders against outsiders. Don't be phony just to be part of the group, or insist that others meet all your expectations. 2. EMPATHIZING: Understanding others' feelings. Empathy arises from awareness of others' situations, and from common experiences. DO: Know yourself, so you can imagine the role of another without losing your identity. DON'T: Decide you know what others need. Ask them! 3. LEARNING/CARING NORMS: Learning the responsibilities and expressions of caring, especially from parents, is often a crucial factor in altruistic and compassionate behavior. DO: Teach your children a few positive caring concepts that can be applied to a wide variety of situations. Talk about the reasons for fairness and compassion. Encourage balance between doing for others and doing for themselves. DON'T: Rely only on rules or punishment. Accentuate what's right rather than what's wrong. 4. PRACTICING CARE: From common courtesy to careers in helping professions, taking care of others, empowering them. DO: Learn to listen and respond. 5. DIVERSIFYING: Making an effort to know different kinds of people. DO: Overcome cultural distortions by engaging in common experiences with others. DON'T: Think you know everything about another culture after one encounter. 6. NETWORKING: Working together with others on something you have in common. Networks can be teams that work together every day, or groups connected only by the Internet. DO: Identify stakeholders in a common agenda. Think holistically, share information. DON'T: Let pursuing the goal override caring behavior. 7. RESOLVING CONFLICTS: Learn and use skills and strategies to solve problems without force or intimidation. DO: Learn the skills to transform enemies into partners in a solution that meets everyone's needs. DON'T: Assume all conflict is bad. Some conflict leads to creativity. Don't avoid problems address them. 8.ESTABLISHING GLOBAL CONNECTIONS: "Linking the here and now with people and places far and wide throughout the planet in the service of care." DO: Seek out ways to connect what you do with benefits to the larger world to society, the environment, the future. DON'T: Go crazy because you can't change the world overnight. Don't lose sight of caring by getting lost in power games.